After years of rumor and speculation, Bugatti has finally unveiled the successor to the Veyron, and it boasts some truly hair-raising performance figures. While the company says that the Chiron is an entirely new car, those familiar with the Veyron will likely notice the family resemblance and similar size. Dimensionally, the Chiron is larger than its predecessor, measuring three inches longer, two inches taller, and half an inch wider than the Veyron. It’s also heavier by about 340 pounds, with a reported dry curb weight of 4400 pounds. Fortunately there’s substantially more power on tap here too – more than any production car built before it, as it turns out. The Chiron’s quad-turbocharged W16 churns out an incredible 1478 horsepower and 1180 pound-feet of torque, with peak torque coming in at just 2000 rpm. The power is sent to all four wheels via a seven-speed dual clutch gearbox, and Chiron uses an electronically controlled center differential that can route the power to whichever wheels can use it most effectively. Riding on specially developed Michelin rubber, the Chiron offers some jaw dropping acceleration figures: 0-62 mph in 2.5 seconds, 0-124 mph in under 6.5 seconds, and 0-185 mph in 13.5 seconds. It will top out at an electronically governed 261 miles per hour, making it the fastest production car ever built. Bringing the Chiron back down from speed is dispatched by a massive set of carbon ceramic brakes, with discs measuring 16.5-inches in the front and 15.7 inches in the rear. Those stoppers are further assisted by a rear spoiler / air brake when necessary. Like Veyron, the Chiron employs active aerodynamic elements to bolster either top speed ability or handling, depending on what driving mode the car is set to. If the hydraulically operated rear wing is raised for added stability, the Chiron’s top speed is limited to a mere 236 mph. The Chiron uses a fully adaptive air suspension which allows not only for adjustable ride quality depending on whether you’re cruising or corner carving, but for ride height as well. Five presets are available to tailor it to the particular task at hand, be it charging down the Autobahn at triple digit speeds or negotiating a particularly nasty speed bump in town. Much like modern LMP1 race cars, the Chiron employs the use of central fin for high speed stability, while NACA ducts on the sides of the car feed the motor and a sizable rear diffuser helps channel air at the back. Inside the cabin, the Chiron’s larger dimensions translate to additional head and legroom for passengers as compared to the Veyron. And like its predecessor, the interior of the Chiron is awash in leather, carbon fiber, brush aluminum and other premium materials, indicating its grand touring intentions. Production of the Chiron is limited to just 500 cars, each with a base price tag of $2.6 million before custom options. Like the Veyron, the Chiron will see Grand Sport, Super Sport and Grand Vitesse variants in the future as well, but for the time being, we’ll just have to be content with the latest king of the hill. Check out the comprehensive press release below for additional details. How can you develop a new super sports car if you have already built the best? This was the steep challenge faced by Bugatti engineers in the development of the Chiron. 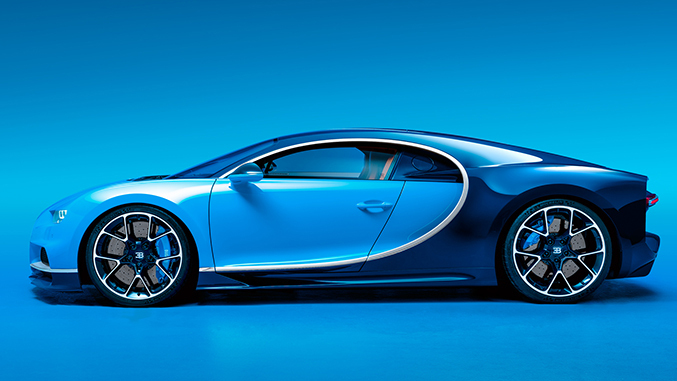 The development brief for the new Bugatti was short and sweet – make the best significantly better in every respect. 1,500 HP was the power target for the Chiron. To achieve this objective, the eight-litre W16 engine which is already well-known to customers and fans was completely redesigned. To achieve a power boost of 25 percent compared with the predecessor, almost every component of the engine was considered and redesigned. To compensate for the weight increase caused by the high power output, greater use is made of lightweight materials such as titanium and carbon fibre. For example, the intake tube, the charge air system and the chain housing are all made of carbon fibre. The weight of the new crankshaft has also been optimised. The key factors in the increased power output are higher-performance turbochargers and duplex fuel injection with 32 injectors. In addition, the charge air cooling system has been improved. As a result, more than 60,000 litres of air per minute are pumped through the engine. The coolant pump is also a very high-performance unit. In one minute, it circulates 800 litres of water through the entire engine. The engine is fitted with four larger, higher-performance turbochargers. They are operated in a two-stage configuration. The two-stage turbocharging system developed by Bugatti especially for this car is the outstanding technical feature of the Chiron powertrain. To ensure maximum acceleration from a standstill without the “turbo lag” feared by sports car drivers, the Chiron moves off the mark with only two turbochargers in operation. The other two units are only activated at about 3,800 rpm. As a result, the two-stage turbocharging delivers an absolutely linear power curve from 2,000 rpm, huge torque in the low engine speed range and a power output that can be controlled and dosed rather well. Another feature that boosts the power output is the new titanium exhaust system with reduced exhaust gas back pressure. The system is fully insulated and equipped with four pre-converters and two main catalytic converters which are considerably larger than their predecessors. The main converters are about six times as large as the unit fitted to a medium-sized car. The total active surface of the six converters used for exhaust gas treatment is about 230,266 m², corresponding to the area of more than 30 soccer fields. From the catalytic converters, the exhaust gas is fed to a silencer which is extremely light compared with similar units, weighing only 20 kg. While other manufacturers use stainless steel, the silencer of the Chiron is made from titanium. The exhaust system is rounded off by six tailpipes, with four routed to the rear and two pointing downwards. The powertrain features a front-axle differential with integrated inter-axle lock and a rear-axle differential with integrated inter-wheel lock and a seven-speed dual-clutch gearbox designed for a torque of 1,600 Nm. This gearbox developed especially by Bugatti has the largest, highest-performance clutch used on a passenger car. It goes almost without saying that the Chiron has permanent four-wheel drive. The monocoque of the Chiron is made entirely from carbon fibre and is designed for crash protection. This newly developed unit is the technically most sophisticated monocoque in its class. For the first time, the rear end of the car is also made from carbon fibre. If all the fibres used in the monocoque were laid out end to end, they would stretch nine times the distance between the earth and the moon. The production of a monocoque takes four weeks. Thanks to the use of high-performance high-tech materials, the structure of the Chiron at the rear end is 8 kg lighter than that of its predecessor. The structure is completed by a carbon fibre underbody manufactured by an innovative sandwich procedure. The sandwich construction, combined with optimised material use, results in a weight saving of 8 kg compared with conventional construction. The structure of a sports car is not only the decisive factor in its weight but also in its rigidity. The Chiron reaches a torsional rigidity of 50,000 Nm per degree and a flexural rigidity of about 0.25 mm per tonne. These are sensationally good values comparable to those of LMP1 racing cars. The new design of the Chiron also meets all the latest worldwide safety standards. The Chiron boasts the most advanced airbag technology available, with a total of six airbags. Thanks to Bugatti’s outstanding expertise in airbag design, it proved possible to develop an airbag that shoots through a carbon fibre housing. This is the case with the dashboard on the passenger’s side and the seat housings. The outer skin of the Chiron is made entirely from carbon fibre with perfectly aligned fibres flowing across the boundaries of neighbouring components without any optical interruption. This alignment, which is the result of skilful handcrafting and uncompromising attention to detail, makes the super sports car a real eyecatcher. Only the highest-quality carbon fibre fabric is used for visible carbon surfaces and six layers of clear coat are applied to ensure a perfect surface. Only Bugatti is so painstaking in this area. In addition, some parts of the body require extremely complex production processes, such as the rear compartment lid or the wings. These do not have any edges or gaps but only fantastic reflections, which also applies to the side. Bugatti has succeeded in developing a body part that extends from the A-pillar to the rear in a single piece – an extremely sophisticated part that is simply beautiful to look at. Last but not least, the new structure of the Chiron allows an optimised package and even more comfort. For the first time, it is possible to stow a suitcase with the size of a cabin trolley approved for air travel (44 litres) in the luggage space of a Bugatti. To provide this space, the radiator is installed in an inclined position, which also allows a larger cooling surface. Bugatti has developed an adaptive chassis for the Chiron. This provides an extremely dynamic driving experience, very direct response, considerably more agility, precise steering response, fast cornering and outstanding roadholding even at high cornering speeds – in other words, the driver has maximum driving pleasure in a very comfortable overall package. The chassis design and power output of the Chiron ensure extreme controllability even when driven at the limit. The responses of steering, brakes and the accelerator pedal are direct and directional stability is outstanding. These advantages are the result of a number of different factors such as the electric steering system, the redesigned front and rear axles and a suspension with newly developed chassis bushings that are bolted directly to the new monocoque, ensuring optimum reactions to driver input. The Chiron is shod with entirely new high-performance tyres, once again developed by Bugatti together with its strategic tyre partner Michelin. As with the Chiron as a whole there are no compromises in the case of the tyres. They must transfer maximum torque of up to 5,000 Nm per wheel safely to the road and develop unprecedentedly high lateral guidance for the high-performance coupe. In addition, they need to be comfortable in city traffic and roll reliably at high speed. The tremendous forces on the tyre at a speed of 400 km/h show what is needed. Each single gram of rubber is exposed to centrifugal force of 3,800 g, the result of acceleration some 3,800 times the force of gravity. The tyres, size 285 / 30 R20 at the front and 355 / 25 R21 at the rear, have a larger contact surface (+14% at the front, +12% at the rear) and therefore greater potential in decisive driving situations with significant improvements in braking behaviour, acceleration, grip on wet and dry roads, noise levels, mechanical comfort and handling at the limits. The extraordinarily high quality of the new Michelin tyres gave the Bugatti experts greater leeway for designing the driving performance of this exceptional sports car. This leeway was used for the development of the new driving dynamics systems. The innovative all-wheel drive system with torque factoring function via an electronically controlled inter-wheel differential lock ensures strong grip even with high tyre distortion angles. The tyres of the Chiron meet extreme requirements, which is why they are tested on aerospace industry test rigs. Last but not least, customers will be pleased to note that the tyres of the Chiron are easier to install and allow lower operating expenses. The world’s fastest production super sports car needs the best brakes in the world. Bugatti uses special carbon ceramic brake discs made from carbon silicon carbide (CSiC). This material makes the brake disk lighter at the same time as giving it greater improved corrosion resistance, performance and durability. In addition, the front and rear brake discs of the Chiron have a diameter which is 20 mm larger and have become 2 mm thicker, resulting in more effective heat dissipation by the brake discs and improved performance on the track. The brake calipers have been entirely newly designed. They are forged from an aluminium part and then milled using bionic principles. In other words, the design is based on structures found in nature. The new architecture allows minimum weight to be combined with maximum rigidity for direct response and very easy dosing of the brakes. Thanks to the new asymmetrical design, the brake caliper can dissipate an extraordinary amount of braking energy. It also looks like a small work of art. The front-axle brake calipers are each fitted with eight titanium pistons, with six titanium pistons on each caliper of the rear axle. As a special feature of the Bugatti brakes, pistons of different diameters are fitted to each caliper. This configuration ensures even pressure distribution over the entire surface of the brake pad, preventing irregular wear. This is complex racing technology that Bugatti has fitted to a production vehicle. The adaptive chassis of the Bugatti Chiron has five different driving programs: Lift, EB “Auto”, Autobahn, Handling und Top Speed. This new control strategy was necessary as a result of the extremely high power output and especially the huge maximum torque of the Chiron, which is available over 70 percent of the entire engine speed range. The main actuators used in the individual driving programs are the chassis height adjustment, the electronically controlled shock absorbers, the electronically controlled power assisted steering, the four-wheel drive with “easy to drift” feature, the electronically controlled rear differential, the aerodynamic control system and the stability and brake control system. All these actuators ensure that the super sports car is ideally adjusted for the driving mode which has been selected. The “Lift” mode is used if the vehicle is to be loaded on a trailer or driven over speed bumps and entries. When a speed of 50 km an hour is reached, the vehicle automatically switches to the base EB “Auto” mode for comfortable and agile driving. In this mode, the chassis height and shock absorbers are automatically controlled as a function of speed and road conditions. If the Chiron is driven faster than 180 km/h, the “Autobahn” mode is automatically activated. In this case, the shock absorber settings are automatically adjusted for comfortable, stable handling at higher speeds on highways. In the “Handling” mode, all systems are set for maximum agility and performance. This mode is recommended for driving on race circuits. The modes Lift, EB “Auto”, Autobahn and Handling can be activated individually using a rotary switch on the steering wheel. The maximum speed in the “’Auto”, “Autobahn” and “Handling” modes is 380 km/h. To reach higher speeds, the driver can activate the “Top Speed” mode, which allows speeds of up to 420 km/h and is activated by a second, separate ignition key. The so-called Speed Key is also a feature of the Veyron and is used by Bugatti to underline the special nature of driving up to top speed. By turning this key, the driver consciously opts for this mode, which is then only enabled by the vehicle if all the relevant systems give the green light. “Safety first” remains Bugatti’s motto. Aerodynamics and cooling are extremely important, especially in the super sports car sector. The Chiron is a largely enclosed vehicle designed to obtain the best possible aerodynamic properties. For this reason, air flow through the vehicle for cooling presents an enormous challenge. This internal combustion engine with a power output of 1,500 HP can generate more than 3,000 HP of heat which needs to be dissipated. The air intake management system of the Chiron is a highly sophisticated system that represents an engineering masterpiece. In order to ensure lower drag, the effective drag area was reduced and designed in such a way that turbulence as a result of rotating wheels is avoided. The remaining exposed area at the front of the vehicle is used in a targeted way to guide the oncoming air through and around the car. Components which play a key role here are the air curtain, the aerodynamic front splitter, the front air intakes for the cooling of brakes, water and air conditioning, the air intakes of the oil cooler and the engine air inlets on the sides as well as the continuous trailing edge on the rear of the vehicle. Three air inflows on each side of the car are used for brake cooling, guiding cooling air through the wheel rim. For this purpose, Bugatti has developed an extremely sophisticated heat shield, for which a patent application has been filed. This shield guides hot air through the brakes to the exterior, providing extremely effective brake cooling. The level underbody of the Chiron is equipped with special air guides in the form of rails, called strakes, and active front diffusers. Air outlets for the main radiator are also installed at the front. In the central section of the underbody, NACA ducts scoop air into the interior to cool the powertrain; other air intakes at the rear provide cooling for the rear brakes. Apart from the passive aerodynamic features already mentioned, the Chiron also has an active aerodynamics system. This is a uniquely sophisticated combination of performance-defining features including the hydraulic diffuser flap with optimised geometry on the front axle to ensure lower drag and improved brake cooling, the adaptive chassis which allows different ground clearances to be set and the active air brake. The adaptive rear spoiler of the Bugatti is unique. On the Chiron, the spoiler can adopt four positions – completely retracted, slightly extended (the position for the Top Speed mode), completely extended (for the Handling and Autobahn modes, with appropriately adapted angles) and also tilted forwards in the air brake position. The level and angle of the wing are adjusted fully automatically in line with the driving situation. The highly efficient design of the rear wing means that an additional spoiler is not required, resulting in lower drag and weight savings. The Chiron is equipped with two cooling water loops, a high-temperature loop for engine cooling and a low-temperature loop for charge air cooling. The high-temperature loop features one main and two auxiliary radiators with 37 litres of cooling water which are pumped through the entire cooling loop in about three seconds. The low-temperature loop designed by Bugatti to ensure outstanding everyday practicality for its super sports cars is equipped with one radiator and has a water volume of 12 litres. This loop prevents the charge air from overheating in stop-and-go driving and urban traffic. The Chiron is the world’s most intelligent production super sports car. It creates ideal conditions for the driver to concentrate fully on piloting a high-performance vehicle and enjoying his emotions without any distractions whatsoever. No fewer than 50 controllers manage the engine and transmission, the chassis components, the air conditioning and comfort functions. And of course, all these systems continue to perform reliably even at speeds significantly over 400 km/h. Bugatti has paid more attention to the future viability of the new Chiron than almost any other carmaker. In order to ensure that a Bugatti remains compatible for many years with peripheral hardware and software which is continuously being developed, the processors fitted to certain controllers feature additional capacity for later programming. A firm foundation has been laid for subsequent expansion, especially in connection with telemetry and connectivity functions. New developments on the Chiron include the complex LED lighting system, the infotainment system with instrument cluster and the air conditioning control unit. To implement special lighting scenarios such as the welcome ceremony, the vehicle lighting system is designed for individual digital control. To accentuate the unique “eight-eye” design of the front end, Bugatti has equipped the Chiron with the flattest full-LED projector headlamps ever fitted to a car, with a height of only 90 mm. Each headlamp has its own controller to operate the LEDs installed behind the main lenses which are mounted on delicate aluminium arms. The eight outer lighting squares consist of light conductors providing sidelight and daytime running light functions. Even in the case of the headlamps, Bugatti has not attempted to save high-quality materials, using carbon fibre for the light trims. The instrument cluster in the cockpit is also a completely new development by Bugatti. The cluster, installed in an aluminium housing, consists of three compact displays surrounding the analogue speedometer. High-resolution TFT displays are positioned to the left and right of the speedometer with a smaller flat IPS display located below. The high-resolution graphics are extremely sharp. The principle is that the driver should be offered only the information that is necessary in view of the driving mode that is active. The faster the Chiron is driven, the simpler the presentation becomes. For example, infotainment data are hidden and the main focus is on the driving data that the driver actually needs to explore the full potential of this super sports car – safely and extremely enjoyably. The Chiron is home to what is probably the most aesthetically pleasing and narrowest central console used in the automobile sector. The console features the selector lever and four round air conditioning switches with indicators under glass hoods which can easily be seen not only from the driver’s seat but also by the passenger. On the first control level, the four rotary switches operate the air distribution, blower, temperature and seat heating functions. But that is not all. In line with the principle that a huge variety of functions should be presented in a way which is clear and allows intuitive operation, the second level of each indicator provides additional functions for the monitoring of driving performance data, also allowing individual programming, if the driver so desires. There are four different settings for the definition of different functions: the Icon mode, the Performance mode, the Cruise mode and the Classic mode. The audio system installed on the Chiron is simply sensational. Developed exclusively for Bugatti by the “accuton” brand, well-known for its high-end equipment, this is the most luxurious sound system available on a super sports car. Audio system connoisseurs will appreciate the use of a one-carat diamond membrane in each of the four tweeters, delivering a crystal-clear sound. In addition, the world’s first mid-range speaker with two separate membrane zones is fitted to the Chiron. In combination with other sophisticated features, the result is a sound platform that makes the Chiron the world’s fastest concert hall. It is almost unsurprising that the system can even be adjusted for different interior materials. It is even possible to take different types of leather into consideration. In the final resort, the occupants of a Chiron experience music not as if they were in front of the stage but as if they were sitting in the midst of the orchestra. Among the equipment elements which are highly appreciated, Bugatti owners emphasise the telemetry function of their vehicles. For the new Chiron, the performance of this function has been significantly enhanced. To date, Bugatti technicians have been able to call up vehicle condition data at the request of the customer. With the telemetry system implemented on the new model, they will be able to carry out detailed preliminary investigations via the channels of the controllers. This can be important in order to make a precise assessment of any irregularities and the urgency of remedial action. In addition to the fast UMTS data transmission standard, the Chiron is also equipped with WLAN (Wifi). For example, this allows drivers to keep a diary of their trips with the super sports car. In line with the heightened security requirements of Bugatti customers, the Chiron also features an extremely high level of electromagnetic compatibility. Here too, the Bugatti engineers did not accept any compromises; to be absolutely sure, they had additional tests carried out on the Chiron in accordance with the applicable military standard. The Chiron is the most modern interpretation of Bugatti’s brand DNA. It embodies the new design language of the luxury brand with its long tradition. The styling accentuates the performance aspect of the super sports car much more strongly. The motto adopted by the Bugatti designers for the Chiron was “Form follows Performance”. The new design language is characterised by extremely generous surfaces, which are demarcated by pronounced lines in the case of the Chiron. The accentuated lines of the Chiron were inspired by the legendary Bugatti Type 57SC Atlantic, the most famous creation of Jean Bugatti, design genius and son of the founder Ettore. The most distinctive design features of the Chiron are the Bugatti horseshoe with the eight-eyed front end, the C-bar on the side (also known as the “Bugatti line”), which is also used as a design element in the interior, the central fin as a reminiscence of the central seam on the Bugatti Atlantic, which extends over the entire vehicle to the rear, and the redesigned rear end with the newly developed rear light, which is unique in the automobile industry and gives the Chiron its distinctive Bugatti signature. Most of these elements have a technical background and have been designed to fully accentuate the growing performance requirements of the Chiron. The Chiron is higher and wider than its predecessor, which allows for more space, especially in the footwell, and improved ergonomics. The headroom has been increased by 12 mm. The wider front end of the vehicle is highlighted by the new eight-eye face. Apart from the lamp housings, the front end features a highly effective air inlet for the cooling of the front wheels and brakes and therefore performs an important aerodynamic function. That also applies to the Bugatti line, which not only emphatically defines the sides of the exterior but is also conspicuous in the interior. The exterior line impressively reflects Bugatti’s design ethos which ideally calls for shapes and lines to be derived from technical requirements. This is not only a beautiful styling line. Its positioning was defined by the need to improve engine ventilation and ventilation performance in general at this point. Behind the A-pillar a very useful fresh air flow enters the vehicle at the level of the window. The air is absorbed by the C-bar, guided through to the wheel arch and leaves the car via the rear. A trim strip with a length of 2.80 metres effectively sets the scene for the side line. This strip is made from a special aluminium alloy with hand polishing to ensure a high gloss. If the customer so wishes, the strip is available in a number of different colours. It is embedded both in the side and in the door. The interaction of an aluminium trim strip of this size and shape and the carbon fibre outer skin poses a special challenge, which Bugatti has mastered impressively. This detail alone already demonstrates Bugatti’s ability to facilitate the impossible. 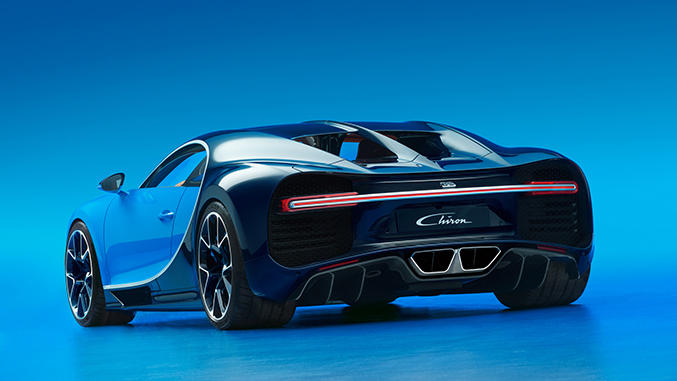 The rear with its all-round trailing edge is the clearest example of form following performance in the design of the Chiron. The rear is shaped to ensure lower drag and to meet the requirements posed by the high power output, the new top speed and heat dissipation from the rear end. The suction effect behind the rear end allows the extraction of hot air collecting in the engine compartment. Although this rear design is not entirely new in the sports car sector, the combined rear, brake, reversing and indicator light certainly is. The designers developed this homogeneous light strip with a length of 1.60 metres extending over the entire rear without any interruptions with a view to making a purist statement emphasising the width of the Chiron. The rear light strip is the unmistakable signature and unique feature of this Bugatti. The Chiron is the first and only production car to feature a rear light of this type. The light strip is only a few millimetres high and is surrounded by a bar machined from solid aluminium. 82 Super RED LED lamps ensure that all road-users can immediately see that a Bugatti Chiron is driving ahead of them. The lines of the new car show that the balance between “beauty” and “beast” needed in a modern Bugatti has been significantly shifted in the direction of aggression in the case of the new Chiron. This can be seen from the considerably more dynamic sideline, the central fin that gives an impression of acceleration, the elongated rear wings and the more dynamic angle of attack. A two-tone colour scheme is a classic element in Bugatti’s design DNA. However, the boundary between the two colours does not run across components in the case of the Chiron but follows the edges of components in a highly technical way. In the past, more than 50 percent of Veyron customers chose a two-tone colour scheme for their car. Similar developments are expected in the case of the Chiron although the new model will still look extremely seductive and impressive in a single-tone scheme. At a standstill, the Chiron already has emphatic proportions, not least as a result of its larger wheels. The fact that the vehicle is wider also enhances the volume of the powerful wings, allowing the Chiron to flex its muscles. This impression is enhanced by the fact that the doors ahead of the rear wings closely follow the shoulders like a bespoke suit. The rear spoiler (the “air brake”) emphatically accentuates the unparalleled performance generated by the rear-mounted powerplant of the Bugatti. The air brake extends over the full width of the vehicle, making a statement that is both stylistic and technical. Bugatti continues to practise its philosophy of “What you see is what you get“ consistently with the Chiron. This vehicle is constructed in every respect from authentic materials. Parts that look like carbon fibre, aluminium or leather are really made from these materials. All the exterior trim parts, wherever they are installed, are made from aluminium of consistently high grades and quality with an anodised effect. The horseshoe at the front is made from a single part, with the degree of deformation of the edges reaching the limits of technical feasibility. On average, the thickness of the material is no more than 1.5 mm. A special, hand-polished alloy is used to obtain a high gloss finish. The grille inside the horseshoe also explores the limits of feasibility. The lightweight aluminium structure used for the grille of the Chiron has a 3-D effect providing optical depth. However, the grille not only looks good but also has extremely high impact strength as a result of its complex multi-stage production process. The front emblem on the radiator grille, also known as the Bugatti “Macaron“, is a real gem. This symbol is a completely new design which is one third larger than its predecessor. The Bugatti oval is the only component of the Chiron that has not been subjected to the painstaking weight saving programme that is normal practice in the development of a super sports car. This part is allowed to be heavy. The eyecatcher, with a circumference of 26 cm, consists of solid 970 fine silver and enamel and has a total weight of 155 g, including 140 g of silver. Previously, the emblem had 2-D optics, with an art deco logo and a hint of shadow, following examples from the 1920s. The new emblem is a 3-D design creating the effect of letters hovering over the red enamel. This decorative component can only be produced by a handcrafting process that is extremely complex and time-consuming. In all, five layers of enamel are applied in individual processes, followed by baking and hand polishing. Ettore Bugatti, whose motto was “nothing is too beautiful and nothing is too expensive,” would certainly have taken pleasure in this example of sheer craftmanship. The interior reflects the stylistic themes of the exterior including the central fin inspired by the Bugatti Atlantic. This approach ensures a symmetrical layout in the interior. 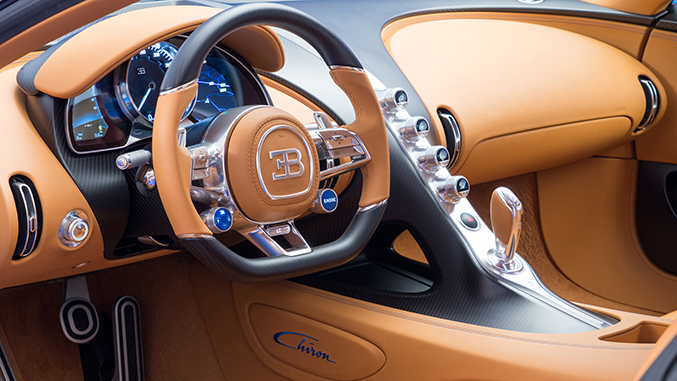 At the same time, the design theme of the Bugatti line is expressed most strongly in the interior of the vehicle. The open oval based on a stylised “C”, the initial of Louis Chiron’s signature, is already a dominant element in the side view of the super sports car and is also taken up in the passenger compartment as a separating line between the symmetrical units for the driver and passenger. The C-shaped light strip emerges from the front bonnet into the passenger compartment as a raised graphic element and merges seamlessly into the dashboard. From here, it flows over the armrest between the seats to the back wall where it rises to the roof liner; at the front, it ends at the rear-view mirror. The homogeneously lit, dimmable light bar is the longest light conductor used in automobiles. This is not the only superlative as it has a surround that is machined from a single piece of aluminium in a complex process and is an eyecatcher in itself. The cockpit layout of the Bugatti Chiron consistently follows functional requirements. In order to keep the central console as slim as possible and to allow a spacious impression, the climate control and infotainment systems have been separated. The units on the central console have independent displays. The selector for the seven-speed dual-clutch gearbox is located in the perfect ergonomic position within easy reach of the driver’s hand. It is produced from the most exclusive materials available and all aluminium parts are milled from solid material. Bugatti is the only carmaker to use anodised aluminium for its controls and to ensure that each individual graphic symbol is illuminated. Bugatti pilots have all the driving dynamics information they need within their field of vision. The instruments visible through the steering wheel with its central horseshoe emblem include the analogue speedometer, the two supplementary digital displays, with the mechanical speed indicator standing out as a result of its exclusive quality. The speedometer runs up to the magic figure of 500 km/h (310 mph) and is a feast for the eyes with the exclusive appearance of a precious Swiss watch. The steering wheel is a classic example of the perfect combination of form and function. With an entirely new design, the steering wheel is the pilot’s control centre. There is no need to take a hand off the steering wheel in order to operate any essential systems. Two multi-function buttons installed on the left and right sides of the inner rim allow the driver to control all the multimedia features of the car, including navigation, telephone, sound system and many other functions. Below the multi-function button, there is a rotary switch for selecting various driving modes on the left-hand side and the starter button on the right-hand side. At the bottom of the wheel, the driver finds a button to activate the launch control function, allowing the Chiron to deploy maximum torque for standing starts and acceleration, leaving all other vehicles behind. Chiron buyers can choose between a full-leather steering wheel or a unit with a combination of leather and carbon fibre. Bugatti is following the wishes of its customers by making very generous use of high-grade carbon fibre material in the interior of the vehicle. The perfectly harmonised material split between leather and carbon fibre creates a luxurious environment commensurate with a technically sophisticated super sports car. At the start of discussions with customers concerning the configuration of their dream car, Bugatti already offers 31 colours for leather and eight colours for alcantara. If customers have special wishes concerning colours or materials, which is rather the rule than the exception at Bugatti, the designers and engineers will do everything in their power to take these into consideration if possible in view of the stringent quality and safety requirements that apply. For a Bugatti, only exclusive materials with the best possible quality of workmanship can be used. It goes without saying that every interior is tailor-made for the individual customer and hand-crafted. A good seating position and optimum seat comfort are especially important in a super sports car. Three types of seat are available for the Chiron. The standard version boasts outstanding seating comfort thanks to its sophisticated upholstery, special seam pattern and the optimum distribution of seat pressure. Electric adjustment functions make for relaxed, ergonomic sitting. This is enhanced by the possibility of manual fore and aft adjustment. The side pads of the seat provide outstanding lateral support. Apart from this all-rounder, Bugatti also offers a sports seat with belt openings made from high-grade polished aluminium for four-point belts and a comfort seat with lumbar support, electric fore and aft adjustment and a memory function. The shelf and stowage concept underlines the Chiron’s claim to be not only a high-performance vehicle but a sports car that is both luxurious and comfortable and stands out from other market players. With open and closed stowage compartments and doors, which are all equipped with dimmable lighting, the driver can choose between a considerable variety of stowage possibilities. Smartphones can be positioned on the central console where they are directly accessible. The cooled glove compartment provides even greater comfort. Suit bags or jackets can be hung up on two high-quality hooks behind the seats. The engineers have even created special stowage spaces for the two ignition keys. The main key for the operation of the super sports car in driving modes up to a speed of 380 km/h has a keyless go function and locks into a position to the right of the steering wheel in order to ensure safe stowage even during very sportive driving. The main key of the Chiron is an elegant, exclusive unit that lies comfortably in the driver’s hand. It is fabricated from aluminium and is covered in leather with decorative seams adapted to the interior equipment of the individual vehicle. The front of the key features the Bugatti logo, handcrafted from silver and enamel in the same workshop that makes the radiator emblem. The famed Bugatti Speed Key has a design appropriate to its name. The key housing is milled from aluminium, polished to a high gloss and boasts the unmistakable blue lettering of the Chiron. The Speed Key has its own stowage location, held in place by an invisible magnet on the switch strip to the left of the driver’s seat. It is therefore immediately visible when the driver enters the vehicle. No other super sports car of this calibre completes such an exacting and complex test program as the Chiron. The process starts with design sketches and 1:1 clay models. These are followed by geometrical drawings showing all interior and exterior surfaces visible to the customers and taking into consideration all technical and aesthetic requirements and then by digital mock-models, until prototypes and pre-series vehicles are built. At each stage in the process, the Chiron is subjected to a large number of tests, checks and correction loops of the type which are normally only used in the development of mass-produced models. More than 30 test vehicles were or still are in use, including six vehicles alone used to ensure compliance with worldwide safety standards and legislation. Two quality and type-testing vehicles are also on the roads. No fewer than 10 pre-series vehicles are being built to lay the foundations for the perfect start of series production in September 2016. The Chiron has spent more than 300 hours in the wind tunnel, completed more than 500,000 test kilometres and used up more than 200 sets of tyres. Apart from comprehensive simulations, the Chiron has completed a large number of tests on test rigs. Some of these, including the engine test bench, had to be redesigned and built especially for the Chiron as existing facilities were inadequate to simulate the loads on a 1,500 HP unit or were simply too small for the new W16 engine. In addition, the Chiron was tested on test rigs operated by the aerospace industry or the armed forces as only these test facilities were adequate for reaching and verifying the performance data that were aimed for. The quality inspectors of the Volkswagen Group will not grant the Chiron any exceptions whatsoever as a result of the small numbers to be produced. Like any other modern Volkswagen Group model, the Chiron must face the most stringent quality requirements possible. As a result, Chiron owners can look forward to a production super sports car of the very highest quality.